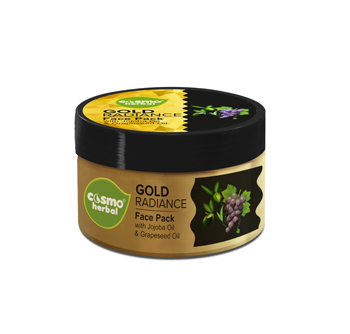 Get a glow like gold with CosmoHerbal’s Gold Radiance Face Pack that comes supplemented with specially formulated nano particles known to rejuvenate the skin from within its core. Its advance active formulation creates a suitable environment for cell growth and regeneration which reduces the signs of ageing and keeping intact that special glow on your face. The constituents of gold help in activating the basal cells of the skin, thereby increasing skin elasticity, removing skin blemishes and wrinkles. 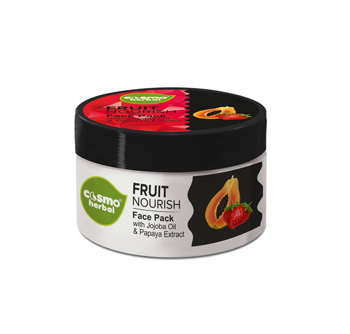 Showering your skin with all the goodness of papaya, the unique Fruit Nourish Face Pack comes enriched with real extracts of the fruit and jojoba oil. It is based on an advanced revitalizing fruit therapy that gives a soft sheen to the skin while rejuvenating it from the inside. Papaya, one of the best ingredients to repair skin damage, when used as a face pack leaves a long lasting glow on the face. The fruit itself has an excellent exfoliating property that helps in the removal of dead cells and absorbs excess oil from the skin surface. 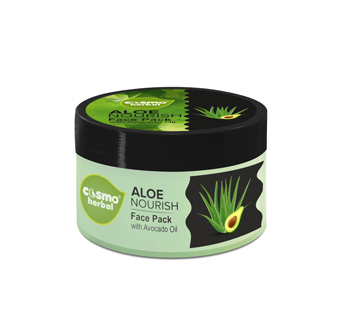 Aloevera helps in maintaining the natural oil balance within the skin. It goes deep into the pores and repairs the damage internally, imparting the skin your desired healthy glow.